"Puns are the highest form of literature"
Ok, so who am I to argue with Alfred Hitchcock? Not that I would argue. I am a fan of the pun. In fact I have said many a time that I should be put in a punitentiary. Pun ALWAYS intended is my motto. Perhaps because I have worked with kids for many many a season, puns and lame jokes are one of my ways to engage kids in my classes - "edu-tainment" my partner calls it. Rope 'em in with a laugh then see what they can learn. With kids - engagement is the first and hardest obstacle to overcome. I get to test my pun and lame jokes out on the little people - and I admit I also get some of my material from them! Speaking of which, last Saturday as part of a weekly drawing challenge via twitter I set about thinking what I could illustrate under the theme of "food". As I teach drama to kids all day Saturday I thought I would ask them. "Draw your favourite food!" was the first response. Which had us all talking about our favourite foods. Being a vegetarian I said that my favourite food would have to be vegetables. 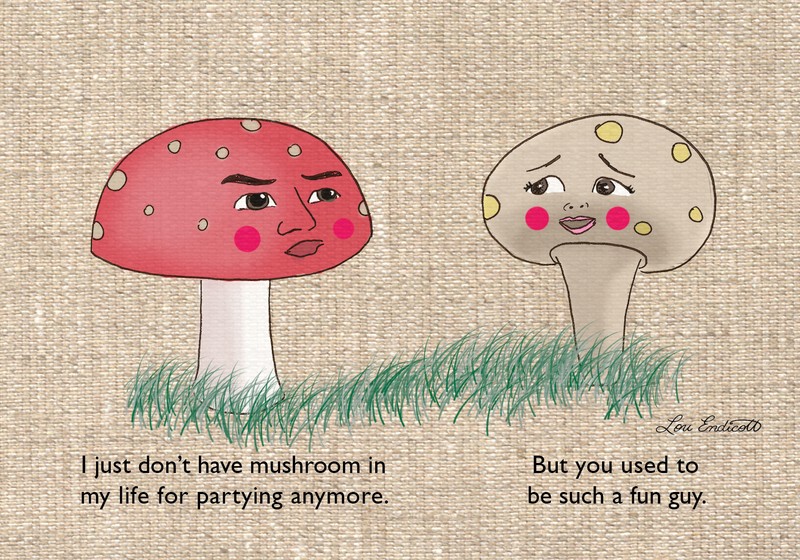 So that started a conversation on what I could illustrate that involved veggies. There was talk of giving them faces, making them dance, putting them in shoes or clothes and putting them with their "best vegetable friends". There was even the suggestion of "put them inside your digestive system!" Which got me laughing. One little girl with big eyes just said "Make the vegetables really funny!" And for me punny is funny. I remembered years and years ago walking through a fruit and veggie shop with my partner. We were just friends at the time and we would always try and make each other laugh. My partner is probably the funniest guy I know. And together we laugh til our eyes leak, our cheeks hurt and our hearts are full. 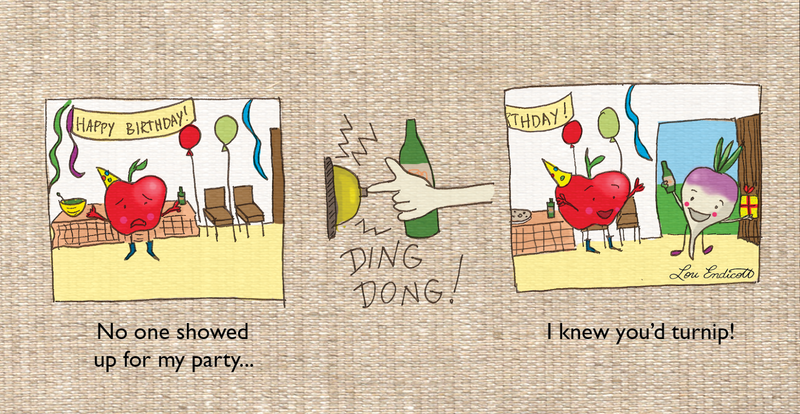 As we walked through the veggie shop all those years ago we kept picking up items and making puns. A tomato was picked up "Hey! You used tomato to me!" A bag of nuts picked up "You. You're completely nuts". A celery bunch in hand waved above heads "You're my best worker. I'm raising your celery!" We even wrote a lame rap around veggies (which I won't go into here as we have a plan to one day release it under a pseudonym complete with animated film clip - so it will go viral and we will make gazillions. You know - real dreams). 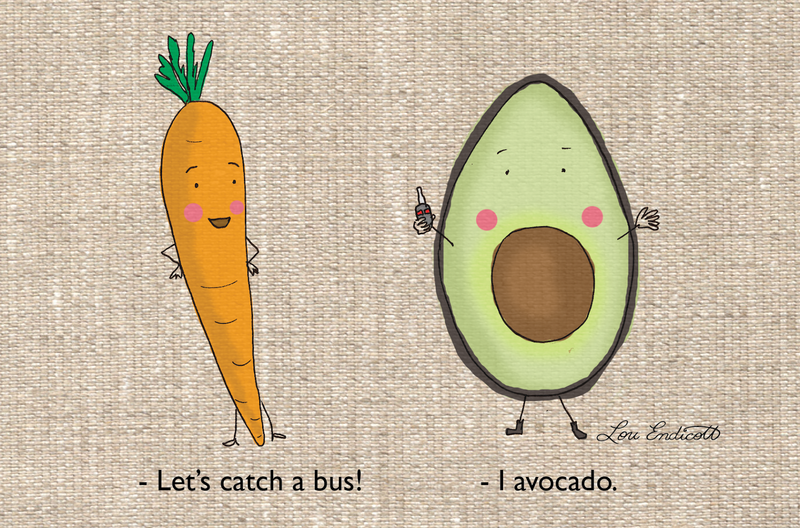 So I decided to use my love of veggies and puns as stimulus for an illustration. But I got carried away and drew three. I will bring them of course to my class next week and ask the kids if they approve.